January. The holidays are over, friends and family at back home and at work, and winter doldrums have set in. For freelancers, the challenge is mustering up the motivation and enthusiasm to get back to work. It’s hard. While those with traditional jobs have no choice, freelancers can sleep an extra hour, linger over their coffee longer, and find bunches of things to do that have nothing to do with their work. It’s easy to get into a pattern of non-productivity, but it must be fought. After all, the bills must be paid. Here are some things you can do to get back in the groove once the holidays have come and gone. Reach out to those clients who have been a long-term client of yours. You can always find a reason to contact them if only to wish them a great 2018. During the conversation, let them know you are looking for new clients for. Express appreciation in advance for any recommendations they may be able to give to business contacts they may have. If they are local, get together for lunch. Just speaking with clients will begin to get your “work juices” flowing. You don’t have to get back to work full blast. You can ease into it by setting up a daily schedule that involves 4 hours or so of work. List exactly what you will do during that 4 hours and stick to it. It may involve drafting up pitches and cold pitching small businesses, but just do it for that 4 hours. No, this will not generate income. But if you are mentally not ready to get back to work, updating your writer website may provide some motivation and spark some enthusiasm for getting back at it. And, truth be told, if you haven’t updated things in a year or so, you need to. This smacks a bit of New Year’s resolutions, but it doesn’t have to. Spend some time thinking about how many new clients you want to acquire this year and what marketing tools you will use to get them. What are realistic income goals? Develop a business plan for the year that spells out exactly what activities you will undertake to meet your goals. There are so many new tools, strategies, and technologies for marketing. Do some research, take a look at some, and see how you might use them for your outreach to potential clients. Marketing content has evolved, and you should be using all of the strategies and tools at your disposal to get your “brand” out there. You are an expert in your freelance niche. Find related blogs, write some great engaging content, and submit your posts for publication. The goal is to get published on blogs that have a large following. That following can easily include those who will be interested in the work you offer. If you do not have a blog attached to your website, then you need to do that. If you do have a blog, look at re-designing it and creating some posts that are compelling – that entertain, that inspire, or that educate. Blogging will help to improve your enthusiasm for your work. With your blog, you can encourage readers to share your content and use techniques to acquire additional email addresses. This means starting an email list by using an email service provider, like ConvertKit (the links to ConvertKit are affiliate links and this site may earn a small commission if you use it). You can offer downloads or e-books in exchange for an email and/or subscription to your blog. Building a larger email following can bring in prospects. And if you can offer discounts or free trials, all the better. You can get your first month free at ConvertKit right here! How can you expand your services this year? If you are a freelance writer, for example, who has focused on website content and product descriptions, can you expand into ghostwriting for others? Might you be able to market yourself as a copywriter for eCommerce businesses? What new skills will you need to acquire to expand what you currently do? If you’re not landing freelance writing jobs consistently or you’re struggling to grow your freelance income, it might be worth it to invest in a course like, Write Your Way to Your First $1k or Writer Website in a Weekend. 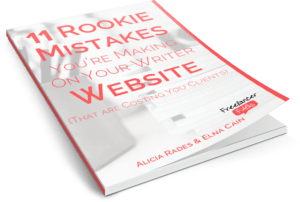 Both of these courses help new writers launch a successful freelance writing business and can help you get out of the slump. Are you checking out job boards? How about Angie’s List? You can also market your portfolio for free on Contently. Be certain to register on as many sites as possible, craft an amazing profile, and establish a reputation for one who provides high quality. Not all of these suggestions will strike a chord with you. But some should. The overall goal is to get yourself back out there, find like-minded individuals who will provide support and motivation, and use the strategies that will bring clients in. It’s hard to ignore clients who are knocking on your doors. Just picking up one or two new ones will stimulate you. How Do I Keep My Information Safe as a Freelancer?